There is truth to the phrase, "seeing is believing." Consumers often read about technology, but they need to experience it in order to see how it fits into their lives and in their homes. Our industry must do more to provide best-in-class, experiential destinations that give a meaningful taste of smart home technology to customers, designers, architects, and builders. I’m proud that in partnership with our dealers, we’re elevating the standard. Many Control4 Dealers around the world have captured the essence of living with Control4 in stunning and elegant showrooms. 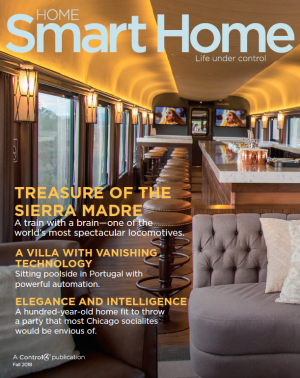 Paired with engaging and immersive demonstrations, these dealers help convey the art of the possible in Control4 Smart Homes. We were so inspired by this blend of technology, visual design, artistry, and creativity – that we built an entire program around it and have asked our dealers to raise the bar. This week, we are excited to announce the availability of 140 Control4 Certified Showrooms located in 25 major markets around the world. When you visit a Control4 Certified Showroom, you’ll be able to see firsthand how we blend disparate home technologies—lighting, music, video, temperature control, networking, and security—to work in unison, creating experiences that will make your life more enjoyable, convenient, comfortable, safe, and secure. In a Control4 Certified Showroom, you can converse with some of the best smart home professionals in the industry, and revel in the quality of their work and admire their creativity in crafting unrivaled and unique smart home experiences; experiences that no DIY device can replicate. Each Control4 Certified Showroom Dealer has met a series of elevated standards and is well-versed in the art of “WOW-ing” visitors through interactive storytelling, visually-stunning displays, and hands-on demonstrations that bring technology to life in a way to help you envision smart living in your own home. Visit a certified showroom near you to #C4Yourself and learn what Control4 and the expertise of our Dealers can offer. The experience will matter.